sorry I felt for James. As a teacher I've actually heard parents tell their kids they hated them and wished they'd never been born. I've heard them blame the father's. This book immediately resonated with me as I am sure it will with so many of my students. The author has commented that his ideas came from several places, especially his favorite book, "The Phantom Tollbooth". I can see how the worlds resemble each other. I loved this world. It is a world I was very familiar with. My students have a difficult time believing there was a time I didn't believe in myself. I considered myself no one special. I would try on occasion to better myself, only to have someone say something that made me feel like I was only average. 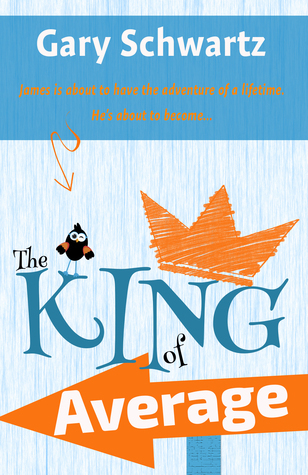 James is whisked away to the land of Average where he is to be tested to see if he is to be their next king. I thought it funny that he wanted to excel at being average because he thought that was the best he could hope for. 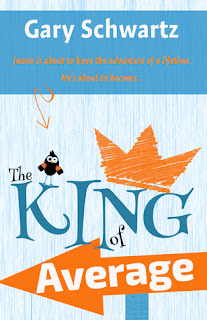 His journey to find out what happened to the last king will change his life in ways he never saw coming. I think this should be required reading in every class, in every school. There are so many people out there like James who need the message in this book. The funny thing is, at age 57, there were lessons I could still learn. Learning to step above seeing yourself as just average or not worth anything for some of us in some situations is an on-going process. I will definitely recommend this book to my fellow teachers and readers, and parents.